Our first reading and our Gospel reading this Sunday both mention that Judas ("the son of destruction") acted "in order that the Scripture might be fulfilled". It is a reminder that God's plan, by his design, has unfolded since the beginning of creation. In our first reading (Acts of the Apostles 1:15-17, 20-26), Peter and the Apostles, with the help of the Holy Spirit, replace Judas as Apostle with Matthias. They most likely considered the significance of the number twelve as important in representing the twelve tribes of Israel and the coming of the "reconstituted Kingdom of Israel" in heaven. Peter stood up in the midst of the brothers - there was a group of about one hundred and twenty persons in the one place -. He said, "My brothers, the Scripture had to be fulfilled which the Holy Spirit spoke beforehand through the mouth of David, concerning Judas, who was the guide for those who arrested Jesus. He was numbered among us and was allotted a share in this ministry. "For it is written in the Book of Psalms: May another take his office. "Therefore, it is necessary that one of the men who accompanied us the whole time the Lord Jesus came and went among us, beginning from the baptism of John until the day on which he was taken up from us, become with us a witness to his resurrection." So they proposed two, Judas called Barsabbas, who was also known as Justus, and Matthias. Then they prayed, "You, Lord, who know the hearts of all, show which one of these two you have chosen to take the place in this apostolic ministry from which Judas turned away to go to his own place." Then they gave lots to them, and the lot fell upon Matthias, and he was counted with the eleven apostles. 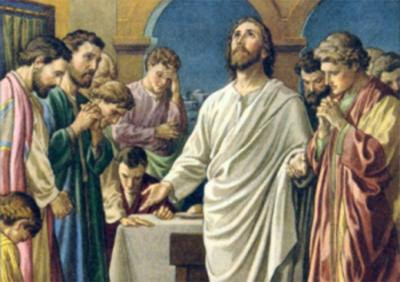 In our Gospel reading (John 17:11-19), we hear a segment of what is known as Jesus' "High Priestly Prayer". It was his final farewell discourse before he was arrested. In it, Jesus talks directly with his Father on behalf of his disciples. He consecrated them to the Father in truth and to their mission on earth. Jesus spoke of his ministry in the past tense as he began to focus on what was to come. Lifting up his eyes to heaven, Jesus prayed saying: "Holy Father, keep them in your name that you have given me, so that they may be one just as we are one. When I was with them I protected them in your name that you gave me, and I guarded them, and none of them was lost except the son of destruction, in order that the Scripture might be fulfilled. But now I am coming to you. I speak this in the world so that they may share my joy completely. I gave them your word, and the world hated them, because they do not belong to the world any more than I belong to the world. I do not ask that you take them out of the world but that you keep them from the evil one. They do not belong to the world any more than I belong to the world. Consecrate them in the truth. Your word is truth. As you sent me into the world, so I sent them into the world. And I consecrate myself for them, so that they also may be consecrated in truth." In our Epistle reading (1 John 4:11-16), we hear a continuation of last Sunday's epistle on the nature of God (God is love) and our response to God's love. John writes that God's entire being is love and God's love is expressed through the gift of his Son as expiation for our sins. And we are called to emulate that love by loving one another, in the same manner that Jesus has loved us. Beloved, if God so loved us, we also must love one another. No one has ever seen God. Yet, if we love one another, God remains in us, and his love is brought to perfection in us. This is how we know that we remain in him and he in us, that he has given us of his Spirit. Moreover, we have seen and testify that the Father sent his Son as savior of the world. Whoever acknowledges that Jesus is the Son of God, God remains in him and he in God. We have come to know and to believe in the love God has for us. The unity that Jesus speaks of between him and the Father is the same unity he speaks of between him and his disciples. Jesus is the bridge. It is the same union John speaks of in his epistle of love. "Whoever acknowledges that Jesus is the Son of God, God remains in him and he in God." It is impossible to remain in God and not love one another, especially those for whom the world or our experience deems unlovable. The more we love, the more we are in God and God in us.